One of the reasons we love The Rawls Group at Keller Williams is because of the amazing tools and educational opportunities we, as agents, are given! On Thursday, November 6th, we had the great pleasure of attending the 3rd Quarter Metro Atlanta Statistics Presentation at LeFont Theater with Shaun Rawls. We went through 89 pages of charts about the recent state of the Metro Atlanta Market. And, it’s good folks. It’s good! Do you remember when you could put your house on the market for the price you wanted and get it? Well, those days are back! I won’t bore you with paragraph after paragraph of laborious details. However, I do want to touch on the highlights. It’s good to know whether you are buying, selling, or just staying put! Who doesn’t want to hear good news? Keller Williams :: Since 2010, Keller Williams has remained #1 in market share of closed transactions in Atlanta! YTD, Keller Williams has 21.5% market share in Metro Atlanta. The next highest brokerage is at 8.1% market share. Moral of the Story :: Do business with a Keller Williams team (particularly The Peters Company)! They are dominating the market! 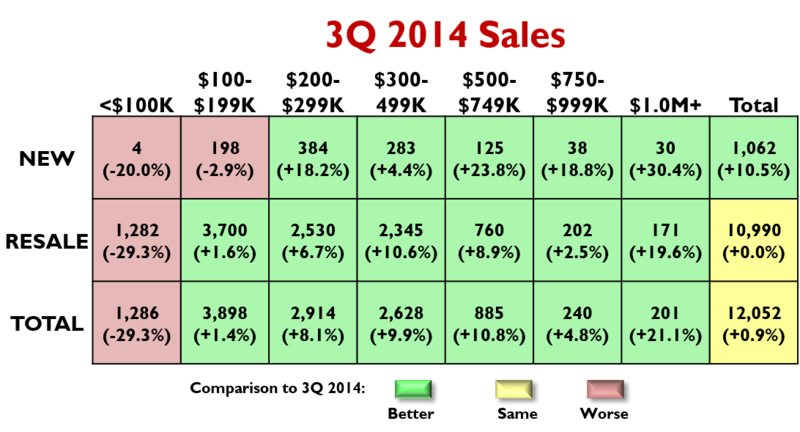 Sales YTD :: Year to date 2014 sales are flat over the same period last year. Once lagged closings catch up, we may see a slight increase over 2013. Sales started out with a very slow 1st Qtr 2014 compared to the previous year. This was experienced nation-wide and Metro Atlanta followed suit. Condos :: While detached sales were flat, the condo market is up 7.4%. Why? Because the median sales price of detached single family homes rose so quickly! Condos became a good value and opportunity for many people. ITP :: Intown sales were actually up 14% overall. They’ve been the economic tow truck for the rest of the market. New Construction :: New home sales actually made up 8.8% of 3rd Qtr 2014 sales. I’d say new construction is HOT! Distressed Sales :: The percentage of foreclosures and short sales in 3 Qtr 2014 was -9.8 percentage points lower than the same quarter last year. 55% of distressed sales are in price points below $200,000. Gone are the days of deals… The deal is getting a house! Did I mention multiple offers abound? Inventory :: Whoa! We need inventory! We’re in a Seller’s Market with only 3.9 months of inventory. What does that mean? At our current sales rate, it would take less than 4 months to sell the current listing inventory if no other listings came on the market. Keep in mind that 6 months is considered a balanced market. Perspective :: In May of 2008, Metro Atlanta had 39,615 listings. In September 2014, Metro Atlanta only had 15,517 listings. Moral of Story :: Now is a GREAT time to sell! And, you’re thinking… Duh? Sales Price :: Even though the 3rd Qtr 2014 sales were mostly flat, the median sales price rose 7.1% compared to 3rd Qtr 2013. It’s baaaackk… The median sales price in September 2014 was higher than the previous high median September price reached in 2007. Back to the Good Ole Days! We are setting new highs in price. Sales to Original List Price Ratio :: With prices on the rise and decreased inventory, sellers are averaging 95.8 percent of their original list price. Days on Market :: Continued low supply in 3 Qtr 2014 helped maintain a lower days on market median at 45 days. Incidence of Price Reductions :: With limited inventory, sellers are starting to push the envelope on prices. In 3 Qtr 2014, Metro Atlanta increased to 41.4% of properties taking a price reduction from 37.2% in 2nd Qtr 2014. Sales to Original List Price Ratio :: We’re outperforming the market. On average, we’re receiving 97.8% of original list price! Our seller clients are getting 2% more than the average Atlanta agent is getting their clients! Days on Market :: Yet again, we’re outperforming the market. On average, we’re selling homes in 17.5 days! Our listings are selling in almost a month less than the average Atlanta agent. Just think… That’s another mortgage payment. For sellers, the news is GREAT! If you price correctly out of the gate, you can expect to arrive at a sales price very close to your list price and minimize showings to a few short weeks! What are you waiting on? Call Andy at 404-419-3619 to get the ball rolling on selling your home today! ← Just Listed :: Charming Split Level in Sandy Springs!